Dismal sales reports from GM, Ford and Toyota cause the industry to have its worst month in 27 years. NEW YORK (CNNMoney.com) -- U.S. auto sales plunged 41% in February, the latest sign of trouble for the battered industry. The weakness was broad-based, with sales of virtually every vehicle offered by the nation's six largest automakers falling at least 10% from year-ago levels. Sales tracker Autodata estimates that industrywide, cars and light trucks sold at a seasonally adjusted annual rate of 9.1 million vehicles last month. That's the lowest level since December 1981. A year ago, this sales rate was 15.4 million. And some suggested the current sales slump may be far from over. Emily Kolinski Morris, senior U.S. economist for Ford Motor (F, Fortune 500), said that while industrywide fleet sales showed some improvement from January when rental car companies pulled back sharply on purchases, sales to consumers fell sharply again in February. "It implies we have not reached the bottom, and pushes that bottom out to some point yet to be determined," she said. Mike DiGiovanni, director of sales analysis for General Motors (GM, Fortune 500), said rising job losses and worries by nearly one in three Americans about the future of their jobs is keeping potential buyers from even considering buying a car. "Americans are hunkering down, pulling in their horns. They're afraid," he said. Bob Schnorbus, chief economist for J.D. Power & Associates, said that jobs were only part of the problem. He said credit is still tight, keeping many people who want to buy a car from being able to do so. He added that the recent decline in stocks is also keeping consumers from spending. Schnorbus also pointed out that the annual sales rate is now well below the 11 million to 13 million vehicles that are normally sent to the scrap heap each year. This could be a sign that there is some pent up demand building for autos, even if the economy doesn't dramatically improve. "If you could free up the credit and get the dread and despair out of the economy, you could see sales picking up without a huge surge in economic activity," he said. Sales at GM tumbled 53%, worse than the 48% drop forecast by sales tracker Edmunds.com. Total sales in the month also fell short of the very weak level from January. There were few bright spots for GM. The best the company could say was that it is seeing improved customer traffic in its showrooms, and that sales to consumers were down 42%, a more modest decline than the overall drop. But a 75% drop in fleet sales hit the overall sales figure. Ford's sales plunged 48% from a year earlier, slightly better than the forecast of a 50% decline from Edmunds. Toyota Motor (TM), which is second in U.S. sales, reported that sales tumbled 40% from a year ago, roughly in line with Edmunds' forecast of a 39% drop. According to figures from sales tracker Autodata, it was the largest year-over-year sales drop ever for the company and the worst level of total monthly sales since 1999. Chrysler LLC was one of the only automakers to report results significantly better than forecasts and January sales levels. The company posted a 44% drop in sales compared to a year ago, but Edmunds had forecast a 55% decline. 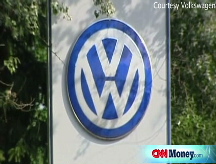 Some industry experts said the company was helped by having the most aggressive sales incentives. Edmunds estimates that Chrysler offered an average of $5,566 in incentives on each vehicle sold, nearly twice the industry average. Chrysler executives told reporters the incentives were part of a deliberate decision to shift away from fleet sales. The company said its retail sales fell only 26% from a year earlier. By comparison, Chrysler's fleet sales toppled 71%. Honda Motor (HMC) reported that its sales tumbled 38% while Nissan (NSANY) said sales dropped 37%. Both numbers were a bit worse than Edmunds' forecasts. In response to this bleak outlook, GM and Ford also announced Tuesday they are cutting production in North America. GM's production will be down 34% from a year earlier, although it will be sharply higher than production during the first quarter, when GM left most assembly lines closed throughout January. Ford is cutting its second quarter production by 38% compared to a year earlier. Weak demand has prompted GM and Chrysler, which have received $17.4 billion in federal loans between them, to ask for another $21.6 billion in federal assistance to see them through the downturn. 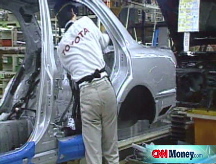 And Toyota announced Tuesday that its financing arm was in talks with a government-backed bank in Japan about a possible loan. Ford, which went into the current crisis with a better cash position, has thus far not asked for federal loans. But it has requested a $9 billion line of credit in case sales don't improve soon. Can these men save Detroit?